The presence of trapeziometacarpal joint osteoarthritis (TMJOA) is a rare cause of upper limb pain in young patients without previous rheumatic disease (quote), as occurs with thumb repetitive activities. New technologies have been associated with upper limb disorders such as neck and shoulder pain related to personal computer use , elbow tendinopathies related to mouse-pad use , hand-arm vibration syndrome related to video gaming  or tenosynovitis related to cellular phone overuse [4-6]. We present two cases of TMJOA associated with touch-screen cellular phone overuse, analyzing its pathogenesis and emphasizing the potential danger of an uncontrolled use of this communication device. Case 1- A 32 year old, right handed, unemployed female presenting left hand first ray pain. The patient reported similar symptoms 3 years ago and was diagnosed as “tendinitis” and treated with immobilization bandage, anti-inflammatory and cooling therapy. Symptoms disappeared completely. However they reappeared two months later. No previous trauma, rheumatic disease symptoms or family history were referred. No pain was referred to the Abductor pollicis longus or Extensor pollicis brevis tendons. Physical examination revealed localized TMJ pain, positive Grind test with a negative Finkelstein sign. 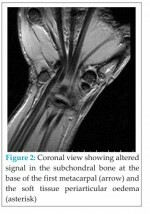 Regarding image studies, X-rays didn’t show any pathology (Fig 1) but TMJOA signs were shown on MRI scan. Physical therapy (laser and paraffin wax bath) was prescribed for four weeks with remission of the symptoms. The patient reported having reduced her left hand activity, but still reports occasional discomfort when she uses it. Case 2- A 33 year old right handed female, complaining about wrist pain for the last month. She is a student without working or sporting activity. No previous trauma, rheumatic disease symptoms or family history were referred. The only finding was a history of several hours a day of smartphone overuse, performing it with her left hand. Due to this pain, the patient reported an increasingly difficult phone use. Physical examination revealed mild local swelling at TMJ area, crepitation with joint mobilization in the grind test, and severe pain with both palpation and joint movement. There were no other physical examination findings, with negative Finkelstein, Tinnel and Phalen signs. Plain x-rays didn´t show joint space narrowing. Initial treatment included movement restriction and NSAIDs for three weeks. 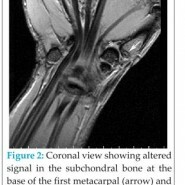 Clinical symptoms and Physical examination remained the same so an MRI scan was performed, showing periarticular inflammatory signs in TMJ with oedema in the adjacent soft tissues, and an altered subchondral bone signal at the metacarpal proximal joint surface (Fig 2). Tendinous structure thickness appeared to be normal and no signs of fluid inside the sheath were found. Brace immobilization including the thumb and physical therapy was prescribed. 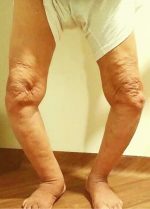 After two periods of paraffin wax bath and laser therapy, the patient had no clinical improvement and the painful joint crepitation persisted. Joint injection containing 1 ml of triamcinolone acetonide (Trigón depot®, Bristol-Myers Squibb) and mepivacaine (Scandinibsa®) was administered. 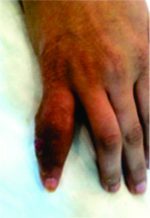 The patient improved significantly with pain disappearance during six months, although she refers some occasional discomfort associated with left hand activities. TMJ represents the most important functional key in a human hand due to its circumduction and opposition abilities. These features differentiate us from other hominids and its anatomy and function is at risk of overloading due to excessive activity . Its saddle shape and reciprocal engagement are stabilized by powerful ligamentous structures such as intermetacarpal ligament, posterior oblique ligament and dorsal radial ligament, which are involved in the movements described above . The introduction of new technologies has led to the appearance of pathologies in the upper limb due to overuse. Cellular phones are not just a system of oral communication but a word processor, a gaming machine or a device to surf the web, becoming a small personal computer. Its abuse has been associated with the occurrence of tenosynovitis [4-6], and we found one case of TMJOA associated with cellular phone overuse , although the patient was older than 45 years, which is considered the limit age for TMJOA onset. Therefore, cellular phone abuse could be considered more an aggravating factor rather than a casual agent. TMJOA usually affects postmenopausal women (80-85%) in their dominant hand (60-65%) . Amongst the various aetiologies described in this disease we can find ligamentous laxity due to hormonal disorders, anatomical joint defects, muscle disorders or joint force imbalance , related with repetitive activities which produce excessive shear forces that can´t be counteracted by the ligamentous stabilizers described above. Gustafsson et al  studied muscle activity in cellular phone usage observing that women had a greater abduction of the thumb, faster movements and fewer pauses. All of these can be considered as causal factors of joint overload and the appearance of TMJOA. Electromagnetic waves have also been involved as a pathogenic factor [4, 9], but further studies are needed to proof their effects on the musculoskeletal system. Study limitations include the fact that the stages described are the initial ones and may not lead to severe joint osteoarthritis. Nevertheless, joint inflammation is related to the onset of osteoarthritis, especially in a joint that is subject to functional stress due to repetitive movements, in addition to the above mentioned risk factors. Therefore, we would be in the early stages of a process that will lead to osteoarthritis unless these habits are modified. The mechanism and dynamics of OA development have been widely discussed in the literature and is not yet completely known. Two mechanisms of cartilage damage are shown as a cause of OA: high stress and fatigue mechanisms . Regarding TMJOA, we think that high stress mechanism is the cause of that pathology. These stresses are determined by activities and lifestyles. Consequently, high stress mechanism would cause the inflammation and bone oedema starting the pathogenesis of OA. Diagnosis must be clinical, supported by additional tests as plain x-rays  and, in early stages, confirming the diagnosis with an MRI scan. The recommended initial treatment is movement restrictions, with or without the use of orthotics, NSAIDS and physical therapy. Corticosteroid injection could be useful in non responding cases. Given the gradual appearance of these overuse pathologies, two-handed use of cellular phone or similar devices is recommended as well as making occasional breaks, slow clicking or supporting your forearms on a surface  to reduce hand overload. Touchscreen cellular phone overuse may be a predisposing factor for the development of joint disorders). We recommend a sensible use of these devices. The trapeziometacarpal osteoarthritis is a disease that will increase their incidence in young patients and should be considered in patients with hand pain with overuse by electronic devices. 1. Hakala PT, Rimpelä AH, Saarni LA, Salminen JJ. Frequent computer-related activities increase the risk of neck-shoulder and low back pain in adolescents. Eur J Public Health 2006 Oct;16(5):536-41. 2. Mirman MJ, Bonian VG. ‘Mouse elbow’: a new repetitive stress injury. J Am Osteopath Assoc. 1992 Jun;92(6):701. 4. Yoong JK. Mobile phones can be a pain–text messaging tenosynovitis. Hosp Med. 2005 Jun;66(6):370. 5. Storr EF, de Vere Beavis FO, Stringer MD. Texting tenosynovitis. N Z Med J 2007 Dec 14;120(1267):U2868. 6. Ashurst JV, Turco DA, Lieb BE. Tenosynovitis caused by texting: an emerging disease. J Am Osteopath Assoc 2010 May;110(5):294-6. 7. Turker T, Thirkannad S. Trapezio-metacarpal arthritis: The price of an opposable thumb! Indian J Plast Surg. 2011 May;44(2):308-16. 8. Connell DA, Pike J, Koulouris G, van Wettering N, Hoy G. MR imaging of thumb carpometacarpal joint ligament injuries. J Hand Surg Br 2004 Feb;29(1):46-54. 9. Ming Z, Pietikainen S, Hänninen O. Excessive texting in pathophysiology of first carpometacarpal joint arthritis. Pathophysiology 2006 Dec;13(4):269-70. 10. Haase SC, Chung KC. An evidence-based approach to treating thumb carpometacarpal joint arthritis. Plast Reconstr Surg. 2011 Feb;127(2):918-25. 11. Najima H, Oberlin C, Alnot JY, Cadot B. Anatomical and biomechanical studies of the pathogenesis of trapeziometacarpal degenerative arthritis. 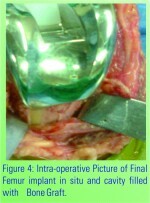 J Hand Surg Br 1997 Apr;22(2):183-8. 12. Gustafsson E, Johnson PW, Hagberg M. Thumb postures and physical loads during mobile phone use – a comparison of young adults with and without musculoskeletal symptoms. J Electromyogr Kinesiol 2010 Feb;20(1):127-35. 13. Seedhom BB. Conditioning of cartilage during normal activities is an importante factor in the development of osteoarthritis. Rheumatology (Oxford) 2006; 45(2): 146-9. 14. Cooke KS, Singson RD, Glickel SZ, Eaton RG. Degenerative changes of the trapeziometacarpal joint: radiologic assessment. Skeletal Radiol 1995 Oct;24(7):523-7. 15. Williams IW, Kennedy BS. Texting tendinitis in a teenager. J Fam Pract. 2011 Feb;60(2):66-7.